Know about the top pharmaceutical companies in India as per their net profit in last quarter. Indian pharmaceutical sector is the second fastest growing sector that has 27.32% growth rate. India contributes about 8% of world’s total pharmaceutical production. Companies are acquiring small companies and expanding their market. 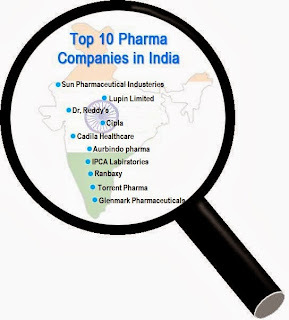 Following are the top 10 Indian based pharmaceutical industries. 1. Sun Pharmaceutical Industries Limited: Sun Pharma is one of the fast growing pharmaceutical companies in India. Sun Pharma was started in 1983 by Mr. Dilip Shanghavi. The company has its business in API and formulation having 11 manufacturing plants in India and 2 units in the United States. Sun Pharma has its hold over the diabetic drugs market. In the second quarter ended on September 30, 2013, its net sale was `41920 million with a net profit of `13620 million holding the first position in pharmaceuticals. 2. Lupin: Lupin is a Mumbai based company and it was established in 1968. Lupin is one of the largest manufactures of generic formulations and API. It has a strong market and holds the market of Tuberculosis drugs. In the last quarter ended on September 30, 2013 Lupin earned a net profit of `8091.2 million and holds the second position in pharmaceutical industries. 3. Dr. Reddy’s Laboratories: Dr. Reddy’s is a Hyderabad based company and was started in 1984 as an API manufacturer. Now it manufactures the drugs of about all therapeutic areas. Net profit of Dr. Reddy’s was of `7733.8 million in the quarter ended on September 30, 2013 having great growth as compared to `3630.3 million in the quarter ended on September 30, 2012. 4. Cipla: Cipla is a Mumbai based company and it was established in 1935 by Dr. Yusuf K Hamied. Cipla was visited by M.K. Gandhi in 1939. Cipla had net sales of `24631.8 million with a profit of `3580.6 million in the quarter ended on September 30, 2013. It is decreased by 27% from the second quarter of 2012. 5. Cadila Healthcare Ltd: Cadila Healthcare is an Ahmadabad based company and it was started in 1952. It has a strong market in women healthcare and gastrointestinal drugs. Its net profit in the quarter ended on September 30, 2013 was `1830 million. 6. Aurobindo Pharma: Aurobindo Pharma is a Hyderabad based pharmaceutical company and it was established in 1986. It majorly produces antibiotic and antiviral drugs. Its net profit in the quarter ended on September 30, 2013 was `1797.0 million compared to the net profit of `2380.0 million for the quarter ended on September 30, 2012. 7. IPCA Laboratories Limited: IPCA Laboratories earned a net profit of `1620.0 million in the quarter ended on September 30, 2013. 8. Ranbaxy: Ranbaxy was on the first position in Indian Pharmaceuticals for last many years. It has its headquarters in Gurgaon. Net sales of Ranbaxy was `27500.0 million with a net profit of `1352.0 millions in the second quarter of 2013. Revital and Volini are the most popular products of Ranbaxy. The majority of the stake was acquired by Japanese pharma company Daiichi Sankyo in 2008. 9. Torrent Pharmaceuticals Limited: Torrent Pharmaceuticals Limited is a joint venture of Torrent Group. Torrent earned the net profit of `1130 million in the second quarter of year 2013. 10. Glenmark Pharmaceuticals Limited: Glenmark holds the tenth position among Indian pharmaceutical companies with net profit of `1059.48 million for the quarter ended September 30, 2013 as compared to `1373.27 million for the quarter ended September 30, 2012.